My first day of vacation was spent in rural Connecticut with a brilliant philosopher and healer named Bonnitta Roy. The best way I can describe Bonnitta is “The Horse Whisperer”. Just to be clear, I, aka “Brooklyn Girl”, have spent little to no time with horses. The idea to spend the day meditating with horses was definitely not mine. It was my husband’s. As the four of us (daughters ages 18 and 19, husband and me) stepped into the corral, we were asked to choose our horse based the one we connected to the most. Funny enough, I chose the dominant mare and my daughters each chose her one of her offspring. Bonnita explained that horses mirror the current state of our nervous system. In other words, if I am stressed, the horse will be stressed. If I am calm, the horse will mirror that. In other words, there is no “faking it” with horses. We first practiced “Attention”. Picture this, four Bradleys and four horses all standing perfectly still in meditation. (Daughter #2 reminded us that normal families go to the Jersey Shore for vacation). I must say that this was pretty cool. As I relaxed and got quiet I could feel my horse do the same. As kindred hard-headed mothers, I began to bond with my horse. After an hour or so we moved to the round corral to practice “Intention”. This practice would show us how clearly we communicate non-verbally. If the energy behind our intention was muddled then our horse would respond in a confused manner. 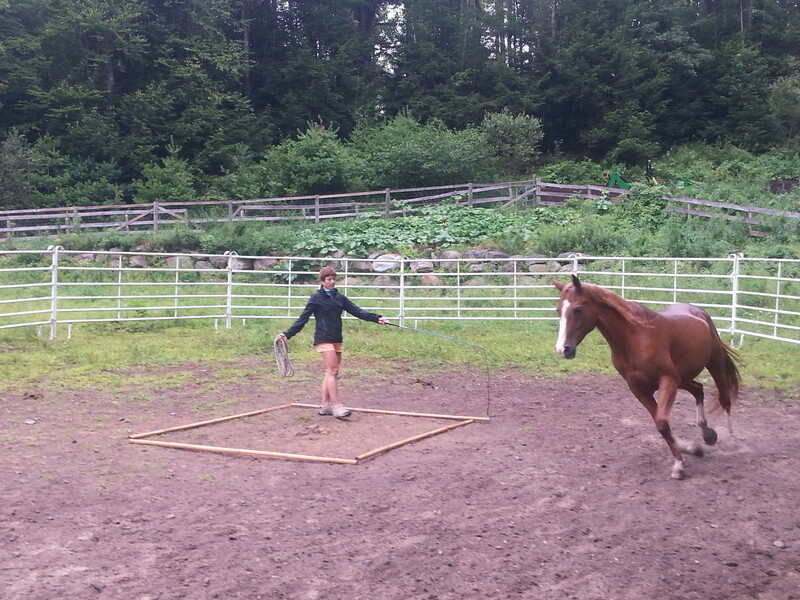 If our intention was clear and directed then our horses would prance, in sync with our non-verbal guidance. My mediation with the horses was definitely enlightening. It made me aware of how often we send mixed messages to one another. We are like a herd of horses reading each other’s nervous systems and responding to each other’s muddled directions. Think about how smooth life would flow if we could all clearly communicate exactly what we need and how we would like each other to prance. PrevPreviousChange is the only constant.